If you have an iPad Air, iPad PRO or the new iPad with a Cellular Data plan, you can use a feature called Personal Hotspot to connect your computer or other devices to the Internet through Wi-Fi, Bluetooth or USB. 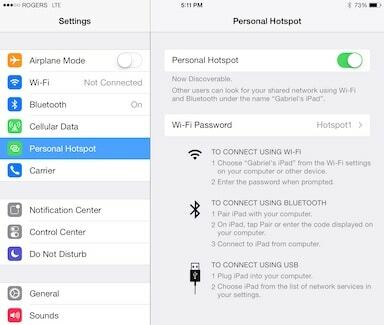 In this post, I’ll show you an example of how to use Personal Hotspot on an iPad Air. Some carriers have limitations regarding support for Personal Hotspots. You can check the following article to find out if your carrier supports this feature. Each iPad has a name that is used for identification purposes when connecting to it through Wi-Fi, Bluetooth or USB. Let’s find out your iPad’s name so that we can connect to it later. 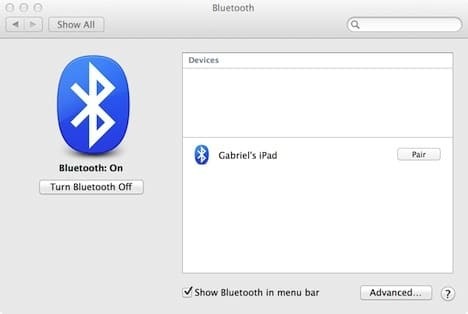 In this example, it’s “Gabriel’s iPad”. Make a mental note or write down yours. You will need this information when connecting other devices to your iPad below. Tip: If you tap on “Name” you can change your iPad’s name to whatever name you want. Before we can enable the Personal Hotspot, we need to have Cellular Data activated. To do this go to Settings > Cellular Data and turn it on. If you have LTE (Long Term Evolution) access, you can enable it as well. This will make your connection faster. Once you have Cellular Data on, go to Settings > Personal Hotspot and turn it on. 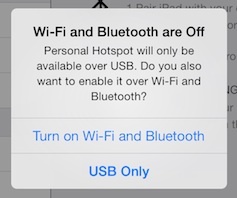 Your iPad will ask you to turn on Wi-Fi and Bluetooth or use USB only. In this example, we’ll tap on Turn on Wi-Fi and Bluetooth. Note: The Personal Hotspot, comes with a default Wi-Fi Password. This password can be changed but it must be at least 8 characters long. Using Wi-Fi is one of the ways to connect to your iPad Hotspot. Now the fun part begins. On your computer, turn on the Wi-Fi and choose your iPad’s name as your WiFi network. When required, enter the password for your Hotspot. After the Wi-Fi is connected, you can start using the Internet from your computer to surf, download emails, etc. Another way to connect to your Hotspot is to pair your computer with your iPad using Bluetooth. In this example, I’ll show you how to do this with a Mac. Look for your iPad name and click on “Pair”. A dialog box with a number will appear on your computer as well as on your iPad. Confirm that the same number appears on both devices and then tap “Pair” on your iPad. Once the devices are connected through Bluetooth, you can start using the Internet on your computer. Note: In both cases (Wi-Fi and Bluetooth) after the connection is established, you will notice a thin blue line on top of your iPad screen showing how many devices are connected to your Personal Hotspot. To turn off Personal Hotspot, go to Settings > Personal Hotspot and turn it off. I have noticed that using Personal Hotspot drains the iPad’s battery faster. Make sure to turn Hotspot off when you are done using it. By the way, you can also connect your iPad or computer to an iPhone with a Cellular Data plan. Have you tried connecting your computer to your iPad Personal Hotspot? How did it go?